We travelled the streets of Los Angeles for the 109th episode of Producing Unscripted. Well, we went a couple of exits down the 101, where we met with this week’s guest, the multitalented Roger Nygard. Roger has edited on many highly acclaimed television series, including Grey’s Anatomy, Curb Your Enthusiasm, and Veep (for which he’s earned an Emmy nomination). He’s also a successful documentarian, with box office hits like Trekkies. Plus, his upcoming doc, The Truth About Marriage premieres soon. He took time to discuss all of this and more when we stopped by his office at the Paramount Studios lot in Hollywood. Today, the excellent Roger Nygard shares priceless tips and advice to help you in your career…whatever path it takes..
Roger is living the life many people in the industry strive for their whole career. He’s successfully working in both scripted and unscripted. Most of the time, he’s editing scripted television, crafting some of today’s most popular TV shows. On the flip side, whenever he’s not up to his ears in footage, he’s travelling around the world, directing, producing, and editing feature-length documentaries. Roger Nygard takes a minute with Joke and Biagio on the Paramount lot. He’s currently editing the final season of VEEP. Roger provided incredible advice that helped shape our careers. When we finished our 2011 documentary, Dying to Do Letterman (which you can watch right now on Amazon), Roger agreed to have dinner with us. He shared his film festival knowledge over the meal. He also encouraged us to submit our doc to Cinequest, a film festival in San Jose. We hadn’t heard of it, but Roger thought it would be a great fit, and said it was an amazing fest. Our film screened at and won the festival, both the Grand Jury and Audience Award. That led to more festivals, more awards, a theatrical release, distribution, and ultimately, the success of the documentary. Roger tackles huge concepts in his films. What better way to follow up his last documentary, The Nature of Existence, than to investigate the deepest secrets of marriage? Today, Roger shares the inside scoop behind his process. How did he deal with a huge topic like marriage? Plus, some of the amazing things he learned along the way. "The Truth About Marriage" – TRAILER from Roger Nygard on Vimeo. And…last but not least…why Biagio’s taking a much closer look at his calendar! You’ll find out about that and more in this month’s episode of Producing Unscripted. Click that giant “Play” button at the top of the page to listen now. Maybe Spike, Mike, Slackers & Dykes by John Pierson? Or Rebel Without a Crew by Robert Rodriguez? Want to learn more about how to tell a great story? Then check out The Writers Journey by Christopher Vogler. Another great one is Story by Robert McKee. Others include Creating Unforgettable Characters by Linda Seger, and The Hero’s Journey by Joseph Campbell. 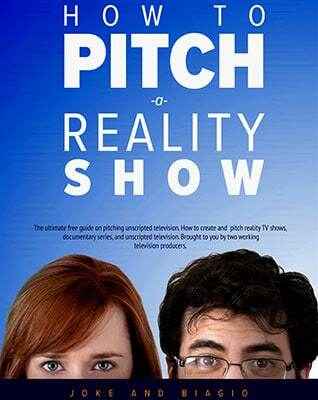 Read our in-depth page about how to pitch us a show. 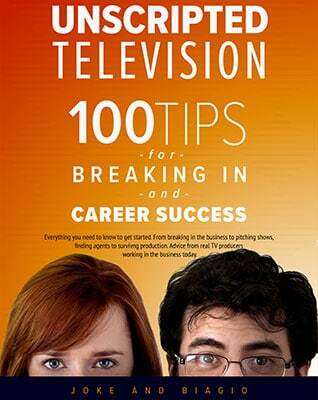 It also talks about what it’s really like to work in our business, the unscripted TV and film industry. Biagio married way out of his league when he bamboozled Joke into saying "I do." Together he and his wife produce television, film, a podcast, and anything else that requires no sleep and a touch of crazy. Find Biagio connecting with you on Twitter, putting out video on Youtube, liking what you do on Facebook, and trying to understand Google+. Spooky: Pitching Paranormal Shows – 4 Tips & Happy Halloween!